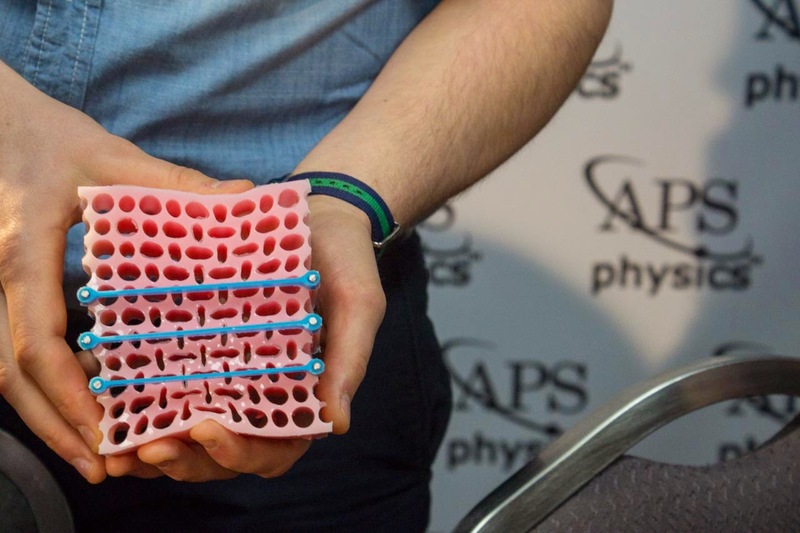 Physics Buzz: The Unnatural Properties of a Designer "Sponge"
Nearly 10,000 physicists have descended on San Antonio this week for the annual American Physical Society March Meeting, the largest meeting of professional physicists in the world. The sheer scale of simultaneous talks is overwhelming and the convention center is so vast that many people are actually running from talk to talk. Bastiaan Florijn at APS March Meeting. In this maze of new developments, I caught up with Bastiaan Florijn, a physicist at Leiden University in the final year of his PhD. 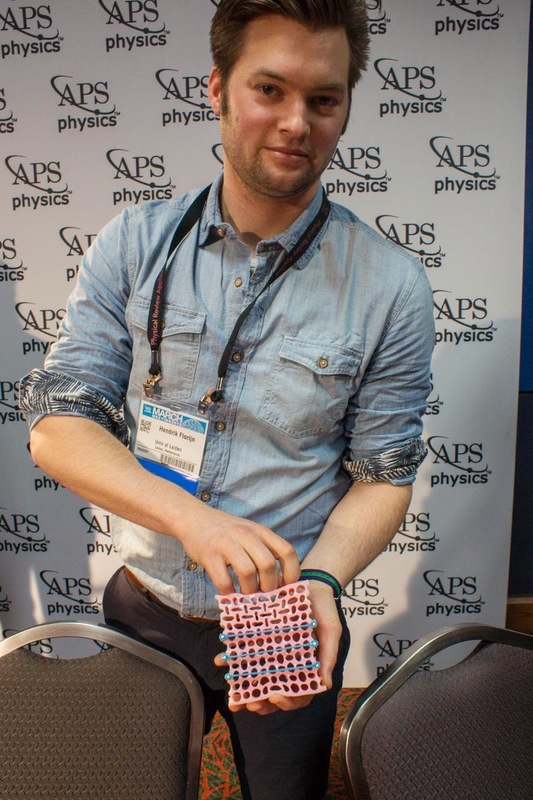 He and his group led by Martin van Hecke have made something that looks like an extra-holey pink sponge but is in fact the first programmable "metamaterial". A metamaterial is something that is carefully engineered to have unique properties that are not often found in nature. This could be a naturally-brittle material that is built, folded, or cut in such a way to become elastic. Or a sound-absorbing material that is tuned to only absorb kinds of sounds. The key idea is that it is the structure, not the type of material (e.g. rubber, metal, or wood) that controls the mechanical properties of the material. In Florijn's case, he wanted to make a material that could buckle under pressure in a controlled way, and bounce back to its original shape afterwards. This could be useful in creating car bumpers that squish and absorb energy in a collision, but can return to their pristine state afterwards. 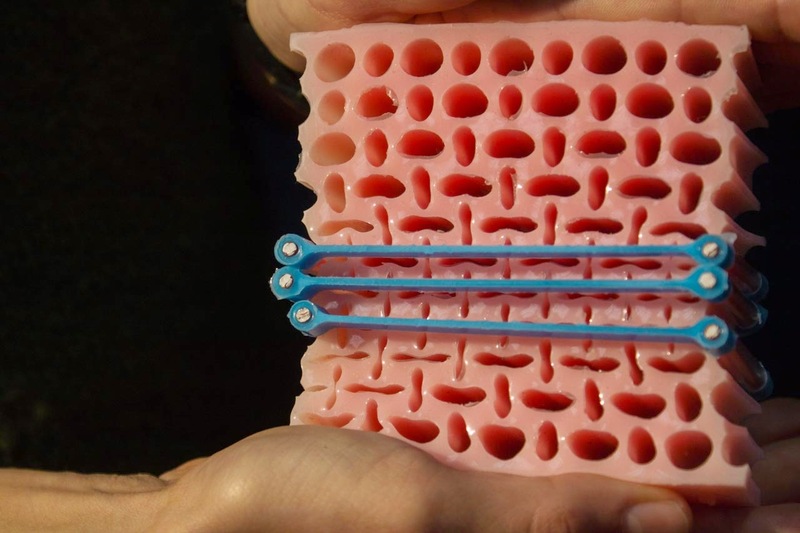 To create the material, Florijn punched a grid of different-sized holes into a silicone rubber slab. He then compressed the material and found some interesting behavior that depends on the size of the holes. This video (courtesy of Florijn and the van Hecke lab) shows the holes squishing into vertical or horizontal ellipses under pressure. Simply by adding holes, already this rubber material has an unusual property not often found in nature. Notice that as the material is pushed down vertically, its width shrinks horizontally. A normal sheet of rubber would buckle outwards and widen instead. This property is known as a negative Poisson ratio and possible applications are only just now being developed that range from shock absorption to fracture-resistant materials. For example a running shoe from Under Armour has recently been unveiled which promises extra comfort thanks to its metamaterial construction. Florijn took this a step further and explored what happens when both the vertical and horizontal axes are compressed. He fixed horizontal rigid clamps (shown in blue in the image below) on the material and again compressed it vertically. The clamps create competition between the holes — some of the holes want to squish into a vertical ellipse but can't because they are bound by the clamps. Using the same material, Florijn found that he could dramatically change its behavior under pressure simply by changing the amount of clamping. In this way, the material could be "programmed" to behave a certain way. Florijn and his colleagues even created negative stiffness, which means that less force (not more) is required to compress the material further. This is like pushing a dead car and finding that the less you push it, the easier it is to move. Very counterintuitive but useful in energy absorption. Imagine a car with a bumper made out of this material, instead of metal. 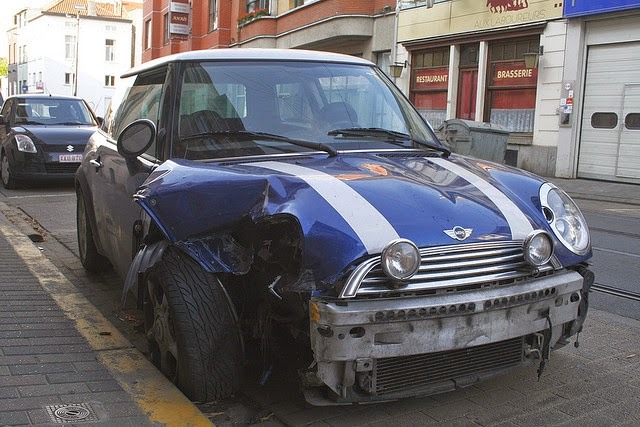 In a normal car crash, the metal bumper will buckle and break, absorbing some of the energy but also requiring an expensive visit to a mechanic to replace the bumper. If the bumper is made of a lattice-like material instead, it could absorb even more energy in a collision, minimizing the force on the passengers inside, but afterwards pop back to its original shape, ready for the next collision. Since Florijn can tune his material to have different properties, a "smart" bumper that changes its stiffness depending on the speed of the car is also possible. Florijn has developed a model that describes exactly how much clamping is necessary in order to get a certain behavior from the rubber sheet. He hopes this model can be used to create "designer material" that is reverse engineered from a final concept, whether that is a smart car bumper, a building or bridge that doesn't break in an earthquake, or a wall that only absorbs certain frequencies of sound. Credit: Mike Lucibella. 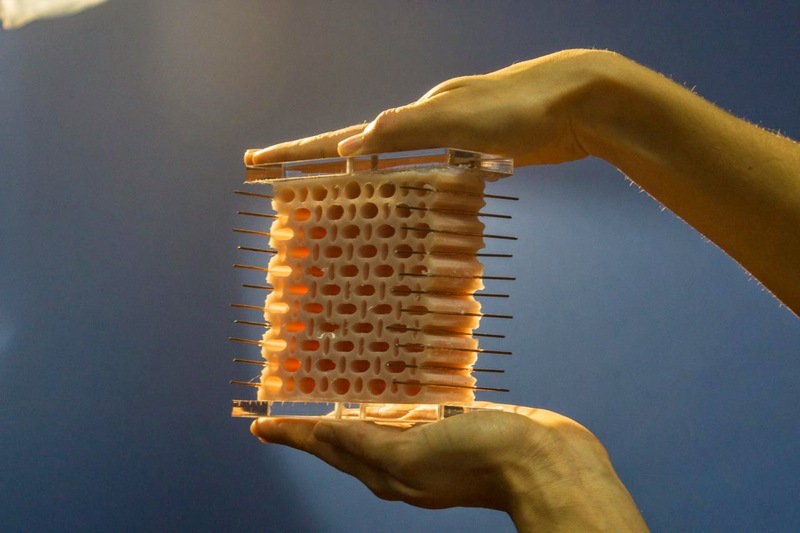 Metamaterial created by Bastiaan Florijn, Leiden University.